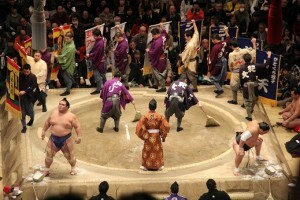 Home > News > Sumo Wrestling Tournament Finished! Sumo wrestling tournament finished yesterday. and, Japanes Sumo wrestler, Kotoshogiku won the tournament!!! Actually there hadn’t been Japanese Champion in this 10years. Also Tokyo Miracle Cycling Tour staff went stadium and cheered. Next tournament will be held in Osaka in March. and coming back to Tokyo in May. Why don’t you come and watch exciting Sumo wrestling and Tokyo Bike Tour!